Changes to the SOA and CAS Curricula are coming in 2018. For students who are not on track to obtain an Associate credential by June 2018, new components will be required to obtain an ASA or ACAS. We’re here to help. As we look ahead to 2018 and beyond, the ACTEX team is already working closely with our authors and instructors to adapt existing or create new study materials, online courses, and texts. Our staff is ready to support students and educators who are navigating these changes. 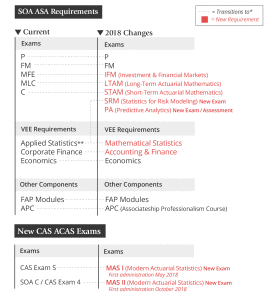 Below is a summary of the Exam Changes. Visit our 2018 Curriculum Changes home page to learn more.